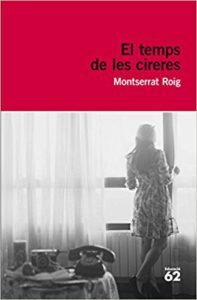 The latest addition to my website is Montserrat Roig‘s El temps de les cireres [The Time of Cherries]. It tells the story of Natalia, who has been away twelve years from her home town of Barcelona, primarily in England, and is now returning home, in 1974, aged forty and just eighteen months before the death of Franco. She has issues with her family, primarily her father and brother, and we follow the difficult life of her mother (now dead), her sister-in-law and her aunt, all of whom have had less than successful marriages. We see the influence of the Civil War on all of these people, invariably negative, and we see that in some respects that Barcelona has not changed but, in other respects, is doing so. Natalia tries to come to terms with both her family and late-Franco Barcelona.